Use outside air to cool the house when the temperature is below 77° F. That means opening windows and letting air flow naturally or giving it an assist with fans. Draw air into the home, particularly during the night when it is cool. During the day, as the temperature rises, close it up to keep the hot air out. If you do need to draw in some outside air, pull it from the cooler north side of the home that doesn't get heated up by direct sunlight. In the morning, you can pull air from the west side as well, and in the afternoon, the east side of the home should be cooling down as it loses direct sunlight. The natural tendency of warmer air to rise and cooler air to fall can help you ventilate. 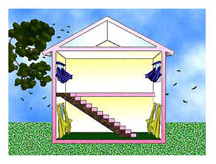 In two-story homes, open windows both on the top floor and on the bottom level to let air flow up and out. Single-story homes having double-hung windows can create an effect by opening the lower part on the cool side of your home and pulling down the top part on the warmer side. Even this little difference will allow air to move by itself. On breezy days, just open windows and screened doors in the path of the prevailing wind to enjoy some free cooling.